In June, the Saudi-led military coalition and associated ground forces began their long-anticipated offensive against Houthi-held Hudaydah city. The ports of Hudaydah and nearby Saleef, along Yemen’s Red Sea coast, are the entry point for the majority of the country’s commercial and humanitarian imports. This creates the potential for catastrophic humanitarian fallout from the offensive given that 8.4 million Yemenis are already on the verge of famine. United Nations Special Envoy for Yemen, Martin Griffiths, spent most of June engaged in shuttle diplomacy with the belligerent parties to the conflict, and in consultations with the UN Security Council (UNSC), pushing a plan to preempt the attack by having Houthi forces turn control of Hudaydah port over to UN monitors (see ‘The UN Special Envoy’s Plan for Hudaydah Port’). Griffiths also revealed his new proposed framework for wider peace negotiations to the UNSC. While including some elements that differentiate it from previous UN-led peace initiatives, contentious items that led earlier efforts to fail were carried over into Griffiths’ latest proposed framework (see ‘The Special Envoy’s New Peace Framework’). The UNSC itself held three closed-door sessions regarding Yemen in June. The Swedish mission led calls for the UNSC to demand a halt to the Hudaydah attack, while the United Kingdom and Kuwait were at the forefront of pushing back against this effort, with the latter parties largely being successful. Council products regarding Yemen last month thus amounted to generic statements regarding respect for international humanitarian law and the need to protect civilians (see ‘UNSC Discussions on the Hudaydah Offensive’). In the United States, the White House appeared to give tentative approval to the Hudaydah offensive (see ‘White House Position on the Hudaydah Offensive’), while bipartisan opposition to the campaign was notable in Congress (see ‘Congressional Opposition to the Offensive’ and ‘Senate Passes Bill Making US Refueling of Coalition Aircraft Conditional’). In Yemen, the Hudaydah offensive, dubbed ‘Operation Golden Victory’, was launched on June 13, with the United Arab Emirates in primary command of the campaign, supporting and coordinating between various anti-Houthi ground forces (see ‘The Hudaydah Offensive’). These forces managed to take Hudaydah airport from Houthi fighters before Abu Dhabi announced that it would temporarily suspend the attack to allow the UN Special Envoy an opportunity to pursue negotiations (see ‘UAE Announces Pause in Offensive’). The Hudaydah offensive raised widespread humanitarian concerns and concerns regarding the safety of civilians in the city, while also prompting widespread price spikes for basic commodities. In economic developments last month, the Central Bank of Yemen finalized a framework to support the importation of basic commodities, the Austrian firm OMV restarted tests on wellheads in Shabwa governorate, and the Yemeni government launched a new Internet network in an attempt to supplant the Houthi authorities’ control over the national telecommunications. Also in June, Yemeni President Abdo Rabbu Mansour Hadi visited the UAE and met Crown Prince Mohammed bin Zayed al-Nahyan. Shortly after, Hadi flew to Aden, the Yemeni government’s current capital in the country, for his first visit in more than a year and a half. 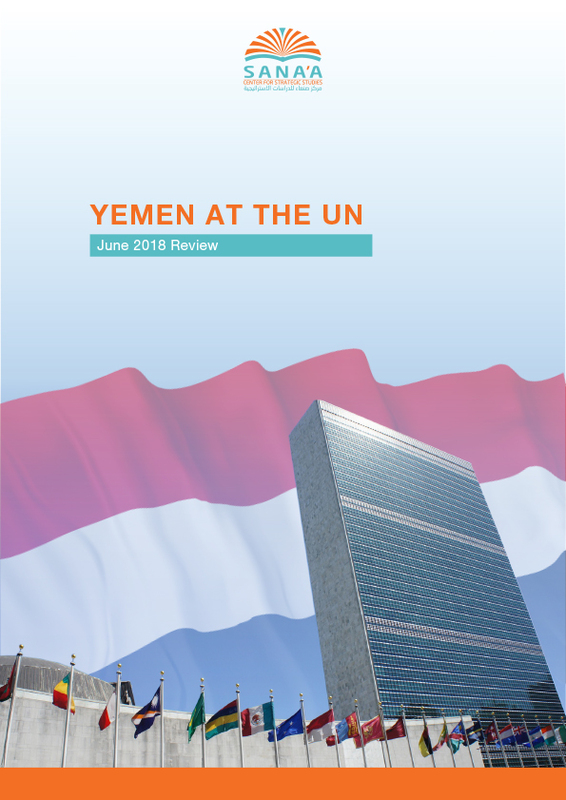 In June, the UN Special Envoy for Yemen Martin Griffiths engaged in shuttle diplomacy between the Houthi leadership, the Saudi-led military coalition and the internationally recognized government of Yemen. The immediate focus of these efforts was to avert a coalition-backed military offensive against the Houthi-held Red Sea port city of Hudaydah, and to establish a framework for wider negotiations to bring an end to the overall conflict. The crux of this round of talks was the status of Hudaydah port, with Griffiths forwarding a plan that would have the Houthi authorities hand control of the port over to the UN. Under this arrangement the UN would transfer revenues from import tariffs to the Central Bank of Yemen (CBY), for the purpose of paying public sector salaries, which have been largely suspended since August 2016. The Houthi leadership had rejected a similar plan put forward by the previous Special Envoy in May 2017. Following talks in Sana’a last month between Griffiths and Houthi officials – including Houthi leader Abdulmalek al-Houthi – Reuters reported on June 21 that the Houthi leadership had indicated a willingness to accept Griffiths’ plan. The Saudi-led military coalition and the Yemeni government indicated throughout talks that any deal would be contingent upon various degrees of Houthi withdrawal. Yemen’s foreign minister Khalid al-Yamani said on June 14 that the “door of diplomacy is closed” to the Houthis and that the international community’s advocating for peace talks would only prolong the war; by June 25, however, al-Yamani said that the internationally recognized government would only accept a Houthi withdrawal from the entire Red Sea coast, adding that port security and management could not be separated from control over Hudaydah city. On June 18, UAE Minister of State for Foreign Affairs Anwar Gargash said only an unconditional Houthi withdrawal from Hudaydah city and port would be accepted as part of a UN-brokered plan. Nevertheless, in a July 5 Security Council briefing, Griffiths reported that the belligerent parties to the conflict had demonstrated a “strong desire for peace” and offered “concrete ideas” to achieve a political solution. Griffiths left for another tour of the region on July 9. The UN Security Council (UNSC) held three closed consultations on Yemen in June, with discussions focusing on the situation in Hudaydah and the potential humanitarian fallout of a coalition-backed offensive to take over the port. In the first meeting, held on June 11 amid anticipation that the offensive was imminent, Griffiths and UN Under-Secretary-General for Humanitarian Affairs and Emergency Relief Coordinator Mark Lowcock urged the council to use their influence to maintain the flow of aid supplies and commercial imports through the port and beyond; ensure all parties meet their obligations to protect civilians and civilian infrastructure; and support the Special Envoy’s efforts to avert a military assault on Hudaydah port. Griffiths also notified the council of the Houthi leadership’s willingness to hand over the administrative part of Hudaydah port to UN observers. The council limited its outcomes to a short press elements, which did not include any reference to Hudaydah. Sana’a Center sources indicated that the statement was watered down by the United Kingdom and Kuwait – the former a major arms supplier to members of the Saudi-led military coalition and the latter a coalition member. Following the meeting, the coalition gave the UN a 48-hour deadline to convince the Houthi leadership to withdraw its forces from Hudaydah. Lana Nusseibeh, UAE ambassador to the UN, sent a letter dated June 13 to the president of the Security Council in which she pressed for “depriving the Houthi militia of its control over the port of Hudaydah,” as a means to bring the group to the negotiating table. Nusseibeh also repeated claims that Hudaydah continued to be the “principal gateway” for the smuggling of Iranian weaponry to Houthi forces, and that the UN Verification and Inspection Mechanism (UNVIM) for Yemen “has not been effective in preventing this continued flow of weaponry.” Notably, a UN Panel of Experts report in January 2018 examined the issue and concluded that it highly improbable that weapons were reaching the Houthis through Hudaydah, given both the UNVIM’s and the coalition’s inspection of cargo ships entering the port. Moreover, the Panel of Experts determined that the impediments to humanitarian and commercial deliveries the Saudi-led military coalition was imposing on northern Yemen were effectively the weaponization of the threat of mass starvation. After the start of the coalition-backed Hudaydah offensive on June 13, the UK — under pressure from UN officials and a number of UNSC member states as penholder of the Yemen file — requested a closed-door consultation meeting for June 14. During the meeting, Special Envoy Griffiths and Deputy Humanitarian Chief Ursula Mueller briefed the council on the situation in Hudaydah via video-link. During the June 14 meeting, Griffiths appeared optimistic regarding a potential agreement with the Houthi leadership that would involve the withdrawal of their forces from Hudaydah port and the implementation of UN supervision. Griffiths reportedly indicated that he would push for a Houthi withdrawal from the entire city — a condition that Houthi officials appear to be unwilling to consider, but which had been presented as non-negotiable by the Yemeni government and the Saudi-led military coalition. During the meeting, Lowcock told the council that the UN Office for the Coordination of Humanitarian Affairs (OCHA) planned to remain in Hudaydah. Speaking to the press before the June 14 meeting, Carl Skau, Sweden’s Ambassador to the UNSC, recommended the council call for an “immediate freeze” to the Hudaydah offensive to avoid an assault on the port, allow time for a political solution to the conflict, and ensure the protection of civilians during the talks. The UK called for compliance with international humanitarian law and the protection of civilians by parties to the conflict, but argued that a ceasefire would be unrealistic given that the offensive had already begun. France, along with Kuwait, said that consensus among members was required for the UNSC to call for a ceasefire. Sweden’s recommendation that the council call for a ceasefire failed to gain support from all member states. Kuwait lobbied heavily against the move, while the UK and France said they did not see a call for the immediate cessation of hostilities as viable. Vassily Nebenzia of Russia, the UNSC president for June, gave a short press statement on the council’s behalf following the meeting. He relayed the council’s call that the ports of Saleef and Hudaydah remain open and that relevant UNSC resolutions – specifically Resolution 2216 – be implemented, urging all sides to uphold their obligations under international humanitarian law. On June 18, another closed-door meeting of the UNSC was held, as scheduled in May, to allow the Special Envoy to share his framework for peace negotiations. At the briefing, Griffiths outlined what he viewed as a “package” of security and political arrangements, sources familiar with the proceedings told the Sana’a Center. These included the establishment of a national military council in Yemen to oversee security arrangements and the handover of medium and heavy weapons by non-state actors, followed by the formation of a transitional government, led by an “agreed upon” prime minister. The transitional government would be in charge of restoring basic services, rebuilding state institutions, addressing issues specifically related to grievances in southern Yemen, implementing the outcomes of the 2013-2014 National Dialogue Conference (NDC) and carrying out electoral reform and national reconciliation. Griffiths’ mandating that southern groups, youth, women and civil society actors be engaged throughout the peace process goes beyond previous UN-led peace plans. However, his framework for negotiations in many other ways resembles previous UN-led plans, specifically those presided over by former UN Special Envoy Ismail Ould Cheikh Ahmed between 2015 and 2017. These previous efforts included several contentious issues, among them being the references to UNSC Resolution 2216, the GCC Initiative and the NDC outcomes as principles for peace talks. Another contentious aspect of the previous peace proposals was the sequencing of military and political arrangements, where it was stipulated that Houthi forces must surrender their medium and heavy weapons and withdraw from captured areas before entering negotiations regarding the make-up of the transitional government. The Houthi leadership saw such requirements – which would entail them giving up their military leverage before securing their place in any future political arrangement – as unacceptable. The above issues were among the primary reasons for the failure of previous peace negotiations and remain part of Griffiths’ latest proposed framework for peace talks. This raises significant doubts as to the viability of Griffiths’ proposal when considering local realities, according to Sana’a Center analysis. The new framework’s detailed discussion of contentious elements also seems to make possible outcomes of peace talks into preconditions for such talks, again eroding the plan’s likelihood for success even before it has brought the warring parties to the negotiation table. Notably, Sana’a Center discussions with Western and regional diplomats in June indicated that the UN Special Envoy was actively seeking to monopolize efforts towards establishing a peace process in Yemen and attempting to sideline diplomatic efforts and peace initiatives taking place outside of the UN umbrella. June 8: A letter to the UN Secretary-General from 24 civil society organizations called for the inclusion of the Saudi-led military coalition and “other violators” in his Annual Report on Children and Armed Conflict, based on violations against the rights of children in the Yemen war as verified by the UN. June 14: In a statement the UN’s Special Adviser on the Prevention of Genocide, Adama Dieng, address the situation in Hudaydah. He said the possible disruption of aid and the threat that coalition airstrikes posed to civilian infrastructure represented the “first test” of Security Council Resolution 2417, adopted last month, which condemned the starvation of civilians as a tactic in war. June 19: UAE Ambassador to the UN, Lana Nusseibeh, submitted a letter to the UNSC on behalf of her government outlining how the Saudi-led military coalition had developed a “large-scale and comprehensive humanitarian surge plan” for aid delivery in Hudaydah. The plan also included other parts of Yemen that rely on imports entering through Hudaydah. According to the letter, this includes the pre-positioning of 50,000 tons of food aid, mine-clearing operations, and the establishment of alternative distribution routes should Houthi activity disrupt the functioning of the port. On June 6, the Reuters news agency quoted an unnamed White House National Security Council official as saying that Washington had warned its allies in the Saudi-led military coalition against actions that would “destroy key infrastructure or that are likely to exacerbate the dire humanitarian situation” in Yemen. The official added that Saudi Arabia and the UAE maintained they would seek a “joint understanding” from allies regarding any assault on Hudaydah port, and its aftermath, without giving further details. On June 22, Deputy Secretary of State, John J. Sullivan, and head of the US Agency for International Development (USAID), Mark Green, met with representatives from international and non-governmental humanitarian organizations. Sullivan and Green endorsed the UN Special Envoy’s efforts to facilitate a peaceful exchange of control over the port and urged against any coalition action to take the port by force. On June 14, the Pentagon denied providing any direct support for the Saudi-led military coalition’s offensive on Hudaydah. News outlets quoted spokesman Major Adrian Galloway as saying the US mandate for direct military engagement in Yemen remained limited to operations against al-Qaeda in the Arabian Peninsula (AQAP) and the so-called ‘Islamic State’ group, or Daesh. He added that support for the Saudi-led military coalition continued to be restricted to aircraft refueling, border security, and intelligence-sharing. According to a June 14 report by the Associated Press (AP) news agency, which cited an unidentified UAE official, the US had rejected three separate requests by the UAE for increased military assistance in support of the coalition’s effort to take Hudaydah city. Included in the requests were greater surveillance and reconnaissance support and minesweeping assistance, according to the Emirati source. In a June 15 letter to Secretary of Defense Jim Mattis, Senators Mike Lee (R-UT) and Bernie Sanders (I-VT) renewed calls for the disclosure of the nature and extent of US involvement in the Yemen conflict in light of the Hudaydah offensive. The senators cited possible violations of both the US Constitution and the War Powers Resolution, specifically Congress’ sole power to declare war. In anticipation of an assault on Hudaydah city, there was an escalation of bipartisan efforts to reorient US policy regarding military support for the Saudi-led military coalition, and calls for greater transparency around US involvement in the conflict. Opposition to the offensive in written and vocal statements by members of Congress have been couched in humanitarian, legal and counterterrorism arguments. On June 28, Senator Menendez then announced that he could not support the proposed sale of more than 120,000 precision-guided munitions to Saudi Arabia and the UAE. He cited continuing concerns in Congress about the risk of civilian casualties as a result of coalition-led military operations in Yemen, and wider US policy regarding the conflict. In a letter to secretaries Pompeo and Mattis, Menendez called on the administration for “additional briefings” to address these concerns before the proposed sale could move to the next stage. As ranking member of the Senate Foreign Affairs Committee, Menendez must approve of the sale before it continues to the formal congressional notification stage. This move could delay the arms transfer, but precedent suggests that actions at the informal or formal notification stage in Congress would be unlikely to result in the blocking of the sale. On June 19, the US Senate passed a version of the annual defense spending bill which included a provision that would add conditionality to US in-flight refueling of Saudi-led military coalition aircraft. The provision in the National Defense Authorization Act for 2019 would require the secretaries of state and defense to certify the coalition’s commitment to a political solution to the conflict, improved humanitarian access, and reduced risk of harm to Yemen’s civilian population. The House version of the bill did not include the same requirements for the coalition, and the provision may change as the two chambers resolve differences at the conference committee stage. The language in the provision derives from a joint resolution spearheaded by Senators Todd Young (R-Ind.) and Jeanne Shaheen (D-N.H.), which the Senate Foreign Relations Committee passed last month (see Yemen at the UN — May 2018 Review). On June 21, in a letter to Secretary Pompeo and Secretary of Homeland Security Kirstjen Michele Nielsen, 40 lawmakers called for the renewal of the Temporary Protected Status (TPS) for Yemen, before its expiry on July 5, 2018. The TPS gives legal status to an estimated 1,200 Yemeni nationals based in the US. Yemen was first designated for TPS on September 3, 2015, with the date of the last renewal January 4, 2017, prior to President Donald Trump’s inauguration. The current administration has allowed the majority of TPS designations it inherited to expire, with only Yemen, Somalia, Syria and South Sudan retaining the status. The Department of Homeland Security ended the TPS for Sudan, Nicaragua, and Haiti in late 2017; El Salvador in January 2018; and Nepal and Honduras in April — affecting around 300,000 individuals. On July 5, the White House announced it would extend the TPS designation for at least another 18 months for those Yemenis who arrived in the US before early 2017. On June 26, in a 5–4 decision, the US Supreme Court upheld President Trump’s September 2017 presidential proclamation restricting entry to the US for nationals from eight countries, including Yemen. This is the third such travel restriction introduced by the Trump administration. While the ban applies to a narrower group of visa applicants from the named countries than its previous iterations, this version contains no timeframe, meaning the restrictions could apply indefinitely. The case has been referred back to the Ninth Circuit Court of Appeals, but challenges are unlikely to succeed, according to the Supreme Court ruling. On June 6, the US Central Command (CENTCOM) published details on US strikes against AQAP and Daesh in Yemen. These suggested that, based on the frequency of strikes thus far this year, they were on pace to be significantly less than in 2017. In CENTCOM’s self-reported statistics, the US military had launched 28 strikes so far this year — 17 in al-Bayda governorate, eight in Hadramawt, and three in Shabwah. According to CENTCOM the US military launched 156 strikes over the course of 2017. Importantly, the US military has frequently under-reported the number of airstrikes it commits during counter-terrorism operations. France and Saudi Arabia co-hosted a conference in Paris on June 27 to discuss the humanitarian situation in Yemen. Ahead of the summit, 30 humanitarian organizations threatened to snub the event, stating that it lacked credibility with Saudi Arabia as a co-host. On the eve of the conference, 14 NGOs then urged France to condemn attacks against civilians in Yemen, publicly acknowledge the humanitarian risks of the Hudaydah offensive, and suspend arms sales to Saudi Arabia and the UAE. The conference was originally envisioned as a forum for foreign ministers, but was subsequently downgraded to an ‘experts level’ event due to the Hudaydah offensive, according to a French diplomatic source quoted by Reuters. Participants included representatives of UNSC permanent member states, UN humanitarian agencies, representatives from the EU, the Arab League, the Hadi government and members of the Saudi-led military coalition, among others. On June 25, the UN Special Envoy Martin Griffiths briefed the European Union Foreign Affairs Council on the latest developments in Yemen. At the meeting, European foreign ministers stressed, among other things, the importance of dialogue with Iran on Yemen. Following the meeting, the Council of the European Union released council conclusions reaffirming that peace could only be ensured through an inclusive peace process and calling for respect for Yemen’s sovereignty and integrity, as well as for a cessation of hostilities and constructive engagement in the UN peace efforts led by Griffiths. The council conclusions also included concerns around the increased use of ballistic missiles by Houthi forces against Saudi Arabia and the non-compliance with the arms embargo established under UNSC Resolution 2216. On June 29, the Belgian Council of State suspended a number of licenses of the arms manufacturer FN Herstal for arms exports to Saudi Arabia. The council stated that the Walloon Region, one of three Belgian federal states, had not demonstrated that relevant legal criteria on arms sales had been met. On June 11, UAE Foreign Minister Abdullah bin Zayed visited President Hadi at his residence in Mecca, Saudi Arabia, and invited him to visit Abu Dhabi, with Hadi travelling to the UAE the following day. This was Hadi’s first visit to the Emirates since tensions escalated between the two in early 2017, with the trip facilitated by Saudi mediation. As part of the visit, a meeting between Hadi and Abu Dhabi Crown Prince Mohammed bin Zayed al-Nahyan was arranged. Talks been the two lasted less than an hour. According to a statement released by Hadi’s office, the Yemeni president and al-Nahyan discussed bilateral relations and Saudi-led military coalition plans to advance on Houthi-held territory. Hadi left for the UAE shortly after Yemeni Interior Minister Ahmed al-Maysari returned to Aden from his own trip to Abu Dhabi, during which al-Maysari and his Emirati counterpart discussed the need to unify the security apparatus in areas retaken from Houthi forces. The visit comes a month after al-Maysari criticized the UAE’s control over the sea and airports in Aden, saying he was required to seek permission from Abu Dhabi to enter and exit the southern city. The comments came during a period of particularly heightened tensions between the UAE and the Yemeni government over the deployment of troops on Yemen’s Socotra Island (for more on the Socotra crisis see Yemen at the UN — May 2018 Review). On June 16, President Hadi, for the first time in over a year and a half, travelled to Aden, his government’s current capital in Yemen. According to statement released by Hadi’s office, the president had returned to Aden to oversee the Red Sea offensive. In Aden he held a number of high-level meetings. In a cabinet meeting on June 20, Hadi urged all government ministers to return to Aden, and in a meeting with the governor of the CBY in Aden on June 25, he reportedly discussed plans to address the liquidity crisis and the servicing of Yemen’s national debt. He also announced the launch of a new internet service to challenge the Houthi authorities’ control over telecommunications in the country (see ‘Economic Developments’). On June 24, the Yemeni president met with Hudaydah political leaders. This was somewhat overshadowed, however, by the visit of Southern Transitional Council (STC) leader Aidarous al-Zubaidi to the western coast on June 20, where he met with leaders from government-aligned and coalition-backed forces. Al-Zubaidi’s visit was indicative of the ongoing jockeying for influence between the STC and Yemeni government, despite consensus on the Hudaydah offensive. June 4: Representatives from the General People’s Congress (GPC) party met with Saudi officials in Riyadh. The delegation included a senior GPC party officials Abu Bakr al-Qirbi, Sultan al-Barakani, among others. Al-Qirbi said the visit was part of efforts to form a broad alliance against the Houthi movement. The GPC splintered after the death of its founder and head, former President Ali Abdullah Saleh, in December 2017. Sana’a Center analysis suggests that the visit was meant to reconcile the positions of GPC leaders who are variously affiliated with either Saudi Arabia or the UAE. June 6: President Hadi appointed Nasser al-Khader Abderbo al-Sawadi, a prominent local tribal leader, as the new Governor of al-Bayda. Since early June, the estimated 3,000 Houthi fighters already stationed in Hudaydah city were boosted by reinforcements from Sana’a, Dhamar and other areas of Hudaydah governorate, in anticipation of an offensive on the port city. On June 7, clashes broke out between Houthi and coalition-backed forces in Ad Durayhimi, 20 km south of Hudaydah city and in Bayt al-Faqih, 35 km southeast of the city, with coalition airstrikes targeting Houthi positions in the area. On June 11, hundreds of coalition fighters, including Emirati and Sudanese troops, arrived in al-Durayhimi. On June 12, UAE Foreign Minister Anwar Gargash said that an ultimatum conveyed via UN Special Envoy Martin Griffiths, demanding the Houthis withdraw from the port or face attack, would expire at midnight local time. On June 13, the Saudi-led military coalition launched Operation Golden Victory to push Houthi forces out of Hudaydah city and take control of the strategic Red Sea port. The UAE has taken primary command of the campaign, supporting and coordinating between coalition-backed anti-Houthi forces on the ground. The offensive began with attacks on Houthi fortifications by coalition aircraft and warships, with ground forces fighting within 6 km of the city. Reported armed forces numbers on each side vary; reports indicated the coalition-backed forces have between 21,000 and 26,500 armed men in their ranks, while Houthi fighters are estimated to number between 5,000 and 8,000 fighters. Earlier anti-Houthi operations along the Red Sea coast to reach Hudaydah city saw the heavy involvement of the National Resistance Forces, led by Tariq Saleh, nephew of the late former President Ali Abdullah Saleh. However, the campaign against the city itself in June was spearheaded by the Giants Brigade, or al-Amaliqa, a 15,000-strong force of six brigades comprised mainly of fighters affiliated with Southern secessionist movements. The offensive began with an immediate push toward Hudaydah airport — a large military and civilian complex of around 8 square-kilometers, located around 13 km from the seaport. Anti-Houthi forces first seized its southern entrance on June 14, setting off fierce fighting within the compound, supported by coalition airstrikes. Houthi forces reportedly blocked roads leading to the airport and installed snipers on rooftops in the nearby Manzar neighborhood. Houthi fighters, travelling within Hudaydah and arriving to the city from other Houthi-controlled areas, have used buses and taxis to travel in an effort to avoid becoming targets for coalition airstrikes, local Sana’a Center researchers reported. Between June 15 and 17, Giants Brigade forces moved toward eastern Hudaydah governorate and the main road linking Hudaydah with the capital Sana’a. In a statement released on June 19, the Hadi government’s Hudaydah governor, Hassan Taher, announced plans to approach the port from two sides: via the main road east of the city and via the coastal road. On June 20, the coalition gained full control over Hudaydah airport. In a counterattack launched on June 26, Houthi forces retook control of the al-Faza and Jahah regions on the coastal road in southern Hudaydah, cutting off the supply lines of coalition-backed forces at Hudaydah airport. Tariq Saleh’s forces later retook the al-Faza area with the support of coalition Apache helicopters. On July 1, Emirati Foreign Minister Anwar Gargash announced on Twitter that the UAE would pause its assault on Hudaydah while the UN attempted to bring the warring parties to the negotiating table, reiterating the UAE’s call for the unconditional withdrawal of Houthi forces from Hudaydah city and port. An hour later Gargash clarified that the freeze had actually begun on June 23 and would last for a week, although the freeze appeared to have been in effect into July, with the UN Special Envoy meeting with Houthi officials in Sana’a on July 2. Houthi spokesman Mohamed Abdulsalam said the UAE’s cessation was part of preparations for a new battle, and that its claims to support diplomatic efforts were a cover-up. Houthi forces have reportedly continued to target coalition and pro-government forces using unmanned aerial vehicles and short-range missiles, with the frontlines lying on the southwest and east periphery of the city as of this writing. Outside of Hudaydah port, the Saudi-led military coalition continues to launch airstrikes against Houthi positions. The members of the Yemeni parliament issued a statement on July 1 opposing the pause in the campaign. The statement blamed “media manipulation” that sought to delegitimize the war and said the pause showed “disregard” for those already killed in the west coast offensive. The parliament called on Hadi, the internationally recognized government and the Saudi-led military coalition to deliver a “decisive victory” over the Houthis forces in Hudaydah. The UAE reportedly blocked an order by Hadi to send four Presidential Guard brigades to join government-aligned forces on the western coast. On June 3 – the same day as an attempted assassination of Nabel Gamel, director of planning for Taiz governorate – protests broke out in Taiz city over rampant abductions and assassinations taking place in the area. The following day representatives from pro-government military and policing bodies met to formulate a strategy to address the insecurity. Following the meeting, the Taiz security department announced a campaign against “extremist militants” in the city. The Salafi Abu al-Abbas Brigade has been participating in the campaign, which began immediately after the meeting and saw raids and arrests starting in the Republican and Arwa areas in the east of the city, then moving further eastward. Assassinations and attacks have persisted despite the security crackdown, targeting government-aligned security forces in the city. These attacks included one on June 9, in which unknown gunmen killed Radwan al-Adini, a pro-government colonel, along with four of his guards in the east of Taiz city. On June 8, government forces supported by the Saudi-led military coalition forced Houthi fighters from parts of Jabal Habashy district west of Taiz city, taking the al-Ramada area located on the road connecting Taiz to Hudaydah, a key Houthi supply line. Houthi units retook a number of government positions in the area on June 12. Simultaneously, on the al-Shaqab front to the southwest of Taiz city, coalition airstrikes targeting Houthi positions in support of government advances in the area. June 7: Forces aligned with the Hadi government ordered civilians to evacuate the contested al-Maton district in western al-Jawf governorate, northern Yemen, designating the area a “hostile territory.” One of the main roads connecting Sana’a with al-Jawf runs through al-Maton. Pro-Hadi forces have made significant progress in the north of al-Jawf, taking Bwaneh mountain on June 7 and the Khoub valley on June 10. June 9: Fragments from a Houthi missile, launched into Jizan province, Saudi Arabia, killed three civilians, according to Saudi state media. Saudi air defences intercepted the missile, along with another launched the following day, according to coalition spokesman Colonel Turki al-Maliki. June 11: Commander of Military Police in Shabwa governorate, Mohammed al-Qahli, was reportedly killed by tribal gunmen. June 12: Pro-government forces foiled an AQAP plot to attack multiple locations in Mukalla city, Hadramawt, to coincide with the end of Ramadan. The raid uncovered 28 IEDs and two explosive belts, among other weapons. June 14: AQAP claimed a complex suicide attack in al-Wade’a district, Abyan, which killed three members of the UAE-backed Hizam al-Amni, or Security Belt forces. A car bomb targeted a Security Belt checkpoint, followed by an armed attack on their adjacent headquarters. Seven personnel were wounded in the attack, including a local Security Belt commander, al-Duaie Mohammed Abdullah Samka. June 17: Saudi military forces attacked Houthi fighters in the Asir province of southwestern Saudi Arabia. Houthi forces responded with shelling and destroyed two armored people carriers in ensuing clashes. Houthi forces launched a Badr-1 missile targeting a Saudi Aramco oil facility in Asir, according to Houthi media reports on June 19. Following the reports, a spokesman for Saudi Aramco said the facility was “operating normally”. June 20: AQAP published an interview with senior leader Khalid bin Umar Batarfi in which he acknowledged dwindling resources and military pressure on the group in Yemen, but promised significant “operations” when conditions were more amenable. While not mentioning Daesh by name, Batarfi said he was willing to collaborate with other militant Islamist groups operating in Yemen, and said that AQAP had made attempts to open lines of communication with such groups. Batarfi also criticized the UAE’s role in Yemen, saying it had an agenda to spread “immorality” at the behest of the US, and voiced his opposition to claims for secession in southern Yemen. June 20: Pro-government forces announced a new coalition-backed operation to push Houthi forces out of al-Bayda governorate. Pro-government forces reportedly took control of Na’man and Nati’ districts, and parts of Fadha valley in al-Malagim district, northwest of the city, on June 22. June 21: In a suspected AQAP attack, an IED killed three members of the UAE-backed Shabwani Elite Forces, and wounded a further three, in Yashbum valley, southern Shabwa governorate. June 21: Yemen’s national army, in coordination with Saudi-led military coalition forces, launched a new counterterrorism operation directed against AQAP in Al Bayda governorate, focused on the area of ​​Qifa, near Rada’a district in the north of the governorate. June 24: Houthi forces launched two ballistic missiles at the Saudi Ministry of Defense’s data center in Riyadh. Saudi state media said the missiles were intercepted by their air defences, while Houthi media reported that the missiles hit their intended targets. Witnesses reported seeing shrapnel in the streets of the capital’s diplomatic area, but no casualties were reported. June 25: The Saudi-led military coalition said eight members of Hezbollah were killed in coalition strikes near the town of Maran, Sa’ada governorate. In a televised speech on June 29, Hezbollah’s leader Sayyed Hassan Nasrallah denied the claim that the coalition had killed any of the group’s fighters, but did not comment as to whether its forces are present on the ground in Yemen. June 26: An IED detonation injured nine members of the UAE-backed Security Belt forces in the mountains of Khabr al-Muraqisha, northeast of Zinjibar city, Abyan governorate. Local sources said Security Belt patrols were combing the area for pockets of AQAP militants at the time of the attack. June 27: Unidentified militants detonated an IED in Aden targeting Colonel Abdul Qadir al-Jaari, chief of staff of the coalition-backed 103rd Presidential Guard. Jaari and two others were injured in the attack, which has not been claimed. In June, the Hudaydah offensive put further pressure on the country’s cash liquidity — a crisis that has become increasingly acute since late 2016. The majority of money exchange shops in Hudaydah reportedly closed last month and the price of basic goods and foodstuffs was rising, prompting panic-buying. According to Oxfam, the price of a bag of rice has increased by 350 percent, wheat by 50 percent and cooking oil by 40 percent since the offensive began. Oxfam also noted the high costs for those trying to flee the city: a family would spend around 60,000 Yemeni rials (YR) (roughly US$150 at the average June exchange rate) to travel from Hudaydah city to Sana’a, where they can expect minimum monthly costs of YR 200,000 (US$500) for rent and food. On June 11, the CBY in Aden finished drafting a procedural framework to support the import of five basic commodities, according to a source connected with the process. The CBY in April announced that it would use part of the US$2 billion in Saudi financial aid, deposited earlier this year, to support imports of rice, wheat, sugar, milk and edible oil (for more, see ‘Yemen at the UN – April and May 2018 Reviews’). In a circular to commercial banks working in Yemen dated June 21, the CBY in Aden listed 15 conditions that banks and traders should meet to be eligible for the pre-reimbursement of Letters of Credit (LCs) for guaranteeing imports. While the Aden CBY has set conditions for regulating the importation process, sources working in the Aden-based banking sector said that up until the end of June, no traders had made requests for opening LCs through commercial banks. Included in the conditions is sight payment for LCs, that they be used to cover only the import of the five specified commodities, and that these commodities should not be transported in partial load shipments. Other significant terms require that all LCs be opened within commercial banks operating in Aden and that equivalent funds in Yemeni rial should be deposited to accounts held by Aden-based CBY. The same sources indicated that the delay in LC requests was not a result of importers’ inability to meet the CBY’s conditions, but rather because the committee responsible for setting up the implementation framework for utilizing the Saudi deposit has not agreed upon a favorable foreign exchange rate for providing importers with foreign currency with which to import goods. At the time of writing, there had been no readjusted foreign exchange rate for funding the import of basic food materials and the rial was trading on the black market at 490 YR to the US dollar at end-June. Sana’a Center economists recommend that any future mechanism to re-adjust the exchange rate should set the official value of the rial against the US dollar no more than 5 percent higher than the parallel market exchange rate, which should help mitigate depreciative pressures on Yemen’s domestic currency. Allowing a larger disparity between official and parallel market exchange rates would increase downward pressure on the YR due to the CBY’s modest foreign cash holdings of US$2.7 billion, which are expected to run out before the end of this year unless replenished. Foreign exchange arbitrage is likely in case of an official overvaluation of the rial — with the introduction of a subsidized exchange rate, traders would be expected to increase their imports of foodstuffs, storing them until the CBY’s foreign currency reserves become exhausted and the YR rapid depreciation, then selling the stock of goods at higher prices. There is also the potential for a surge in demand for foreign currency to meet higher consumption after the arrival of YR 170 billion of newly printed banknotes at the Aden CBY at the beginning of June which, again, would apply downward pressure on the YR.
On June 21, the CEO of the Austrian oil and gas company OMV, Rainer Seele, said the firm had restarted testing wellheads in Block S2, located in the Shabwa governorate basin. Seele said the tests have not yet indicated whether production could be stabilized, adding that the reliability of supporting infrastructure remained a challenge for the company’s operations in Yemen. The company first indicated their intentions to restart production in April this year, with a team travelling to Shabwa to assess viability — the first time a foreign firm has sent oil engineers to the country since the war began. On June 25, President Hadi and Prime Minister Ahmed Obeid Bin Dagher announced the launch of a new telecommunications network, which will be available from the end of July. Aden Net is designed to challenge the Houthi monopoly over internet services. Houthis authorities have controlled Yemen’s Domain Name System servers and Yemen’s only internet service provider, Yemen Net, since they took over the country’s Ministry of Communications and Information Technology in 2015. The government-owned Huawei-installed service will cost around US$100 million, according to a statement from Hadi’s office, and will include fourth-generation mobile network technology. The government estimates the project will generate YR 98 billion per year. Yemeni internet users have encountered censorship in the form of IP address-blocking and occasional service shutdowns by Houthi authorities over the past three years. Yemen has one of the slowest average internet speeds in the world and a long history of restricting online speech and access to messaging applications. In mid-June, the Ministry of Industry and Trade in Sana’a formally banned the circulation of the new large-denomination Yemeni rial banknotes, printed in Russia, which the internationally recognized Yemeni government has been issuing from Aden. From late June, Houthi authorities conducted campaigns on shops, restaurants, exchange companies and banks, arresting those accepting the banknotes. Since the beginning of July, Houthi officials have refrained from preventing the circulation of these banknotes after local authorities in Marib governorate — the country’s main supplier of cooking gas fuels — responded by refusing to sell gas cylinders unless paid for in the denominations of the new Aden-CBY banknotes. In June, the Houthi authorities implemented an aggressive campaign to collect taxes and customs from traders, business companies, and shopping malls operating in Sana’a and in other governorates under their control. Sana’a Center sources based in the capital said that in mid-June, Houthi authorities closed one of the biggest shopping malls in the country, City Max, after its owner refused to pay more than YR 500 million in taxes. On June 24, Houthi tax authorities in Sana’a ordered the partial seizure of telecom company MTN’s assets, claiming that the South Africa-based multinational had YR 11 billion in unpaid dues. Both prior to and following the launch of the coalition-backed offensive against Hudaydah last month, UN agencies, international NGOs and others were warning that the campaign was likely to exacerbate the humanitarian crisis in Yemen, which is already the largest in the world with 22 million people dependent on aid to survive. Hudaydah and nearby Saleef ports are considered the major lifeline for Yemenis, as the point of entry for more than 70 percent of the country’s basic commodities, including staple foods, medical supplies and fuel. Hudaydah city and its surroundings comprise a population of more than 600,000, making it one of the country’s most densely populated areas. The UN Humanitarian Coordinator for Yemen Lise Grande warned on June 8 that “[i]n a prolonged worst case, we fear that as many as 250,000 people may lose everything — even their lives.” She added that “[c]utting off imports through Hudaydah for any length of time will put Yemen’s population at extreme, unjustifiable risk.” In mid-June, the Famine Early Warning System Network (FEWS NET) said that famine could be expected in parts of Yemen in the event of “prolonged” disruption to imports through Hudaydah and Salif ports, with current food stocks only likely to meet national needs for two to three months. Aside from Hudaydah, high-risk regions include Hajjah, Sadah and Taiz governorates. FEWS NET added that those areas accessible from Aden remained vulnerable to famine given the expected increased competition for imports through the southern city’s port. Humanitarian organizations have also expressed concerns of a renewed outbreak of cholera, with the current outbreak having largely stabilized in recent months. According to the Norwegian Refugee Council (NRC), about 162,000 suspected cholera cases have been recorded in Hudaydah since April 2017, equaling 15 percent of the countrywide caseload. As of 14 June, humanitarian agencies and partners were distributing 50,000 litres of safe drinking water on a daily basis in Hudaydah, an unsustainable level in the scenario of disruption to imports through Hudaydah port. On June 13, the day the offensive was launched, UN High Commissioner for Refugees Filippo Grandi expressed fears that increased violence could result in a refugee exodus. OCHA estimates that the Hudaydah offensive was likely to displace about 200,000 citizens, which would add to more than 89,000 internally displaced people (IDPs) already present in Hudaydah governorate and large numbers that had previously fled to other governorates, mostly in the country’s south. On June 10, the UAE issued a three-day grace period for aid agencies to leave Hudaydah. Despite this, UN humanitarian agencies stressed their intent to stay, while continuing to preposition additional aid supplies throughout Hudaydah governorate and adjacent districts in preparation for the assault. On June 14, the UN’s top humanitarian official in Yemen, Lise Grande, said that “[a]gencies have prepositioned 63,000 metric tonnes of food, tens of thousands of emergency kits, nutrition supplies, water and fuel. Medical teams have been dispatched and humanitarian service points established.” A week later, Grande reiterated that humanitarian operations in the city were continuing. On June 13, Saudi Arabia and the UAE announced a five-point plan to protect civilians in Hudaydah governorate and surrounding areas (see below ‘Hudaydah offensive raising concerns over the safety of civilians’). In this context, the Emirates News Agency repeatedly noted throughout the second half of the month, that it was launching an air, sea and land emergency relief bridge, comprised of 10 vessels, seven relief planes and 100 trucks delivering mainly food supplies. The Saudi government also reported that two Saudi relief planes arrived in Aden on June 26, with humanitarian supplies to be transported to Hudaydah. Throughout last month, humanitarian and commercial imports continued to enter Hudaydah port. However, the numbers of vessels was “well below those during the same period in the previous two months,” as noted by the NRC. This was despite media reports in mid-June which indicated that Hudaydah and Salif ports had been declared a “zone of active military conflict” and that commercial vessels were prevented from entering the ports. Electricity has become unavailable in most parts of the city. The water and sewage system has been damaged by trenches dugged up by the conflict parties, leading to water shortages. Some IDP sites have reported of sanitation problems. The NRC said that people in several areas relied on water from mosque wells, stating that “per capita water consumption is likely to be lower than the minimum necessary; and the risk of contamination remains high.” In late June, OCHA reported that damaged pipes had been repaired, improving the city’s water access. Between the launch of the Hudaydah offensive on June 13 and June 29, about 43,000 people had been newly displaced within and from Hudaydah governorate, fleeing mainly to other districts of Hudaydah governorate or to Sana’a. This adds to more than 4,000 households that had been displaced in the governorate in the beginning of the month, prior to the launch of the offensive. Those with the financial means to cover the increased fuel costs, which have more than doubled since March 2015, mostly traveled to relatives in neighboring and distant governorates by public transport or private vehicles. The NRC’s country director in Yemen, Mohamed Abdi, stated that “the people who remain behind are the elderly, children, and disabled people […] It is harder for them to move, especially if they don’t have means or the money to enable them to move from one area or another. There is a danger that some people might not want to move, and they could be trapped in the line of fire.” Many IDPs fled from frontlines north into Hudaydah city, according to a Hudaydah-based charity. During the offensive on Hudaydah airport, people were displaced from the al-Mandhar village, south of the airport, and injured civilians were brought from there to hospitals in Hudaydah city. Hostilities across the governorate’s south have also displaced people from al-Durayhimi, al-Tuhayat, Jabal Ras and Bayt al-Faqiah districts. Both access for humanitarians to reach Hudaydah and for civilians to flee, has deteriorated, given ongoing hostilities, specifically landmines planted by Houthi forces in the south of Hudaydah governorate, roads destroyed by airstrikes, and others blocked by trenches and barricades. While humanitarian aid supplies had been prepositioned in the city in preceding weeks, OCHA and the NRC reported difficulties in accessing warehouses. In mid-June, the NRC said that humanitarian agencies were forced to pause most operations in Hudaydah city, with areas south of Hudaydah city — where many have been injured and displaced — proving inaccessible. Amid conflicting reports regarding the accessibility of Sana’a city, Sana’a Center sources have confirmed that the main road connecting Hudaydah city to the capital remained largely open as of the beginning of July. The inaccessible parts of the road close to Hudaydah airport could be bypassed via other roads in Hudaydah city. Within days, the Hudaydah offensive further increased the pressure on already over-stressed health structures in Yemen, where only half of all health facilities remain functional. Although health facilities in Hudaydah governorate had mostly been spared from being damaged throughout the offensive, as of July 4, security concerns have led seven health facilities in the governorate to temporarily close or suspend operations. Other health facilities in the governorate had to partly suspend operations, given that health personnel had been displaced. Médecins Sans Frontières (MSF) reported that people injured at the Hudaydah frontlines were evacuated to hospitals in Mokha and Aden. While in Mokha there is only one hospital, without any operating theater to perform surgeries, Aden had to set up additional beds and tents to meet the “influx of injured people” from frontlines in Hudaydah and Taiz. May 29-June 5: On May 29 and June 5, the International Organization for Migration (IOM) evacuated 101 and 132 Ethiopian migrants, respectively, transporting them from Hudaydah to Djibouti by sea through its Voluntary Humanitarian Return (VHR) programme. Due to the launch of the Hudaydah offensive in mid-June, IOM put its VHR programme in Hudaydah on hold and postponed the evacuation of more than 200 Ethiopian migrants planned for June 14. Thousands of migrants are estimated to be stranded in frontline areas or nearby. June 6: Off the coast of Yemen, a vessel, transporting at least 100 Ethiopian migrants from Bossaso, Somalia, to Yemen, capsized. According to IOM staff, 46 migrants drowned and 16 remained missing, presumed dead. June 30: OCHA reported that US$1.54 billion out of the US$2.96 billion 2018 Yemen Humanitarian Response Plan (YHRP) had been funded, equaling 52.03 percent of the requested amount. Some US$470 million pledged to the YHRP at the Geneva High-Level Pledging Event in early April thus remained unfulfilled. Notably, various countries have donated some US$466.4 million outside the framework of the YHRP. July 2: Between June 1 and July 2, more than 121,000 IDPs were registered in Hudaydah, Aden, Sana’a, and Ibb governorates. This figure excludes those IDPs awaiting registration in areas hard to access due to security reasons. On June 22, Amnesty International released a report documenting how the belligerent parties have impeded imports of essential goods into Yemen and the movement of humanitarian aid inside the country, focusing on the period following the imposition of a blockade of Yemen’s Red Sea ports by the Saudi-led military coalition in November 2017. June 5: Nine civilians were injured by airstrikes that hit populated areas in Sana’a city, including a strike in close proximity to a UN compound. The airstrikes also affected the offices of two NGOs. According to Action on Armed Violence, civilian casualties caused by explosive weapons have seen a 32 percent increase compared to the same period in 2017, which was mainly due to the 37 percent increase in civilian casualties from airstrikes by the Saudi-led military coalition. June 6: According to Yemeni journalist Nabil Subaye, the journalist Anwar al-Rukn died one day after being released from a one-year detention by Houthi forces, that had included torture and starvation. June 7: The ICRC announced that it was pulling 71 of its foreign staff out of Yemen, stating that its “current activities have been blocked, threatened and directly targeted in recent weeks” and following the killing of one of its international staff in April. Amnesty International Middle East Director of Campaigns, Samah Hadad, reacted by emphasizing that “deliberate attacks on humanitarian relief personnel amount to war crimes.” In order to fully resume its activities in Yemen, the ICRC demands “concrete, solid and actionable guarantees” for the safety of its staff. June 11: An airstrike hit a cholera treatment centre in Abs, Hajjah governorate, newly constructed by MSF, leaving the facility non-functioning. Prior to the attack, MSF had shared the coordinates of the facility with the Saudi-led military coalition, meaning that the facility was protected from attacks under the Geneva Conventions. After the airstrike, MSF temporarily froze its activities in Abs, which include the support of the Abs Rural Hospital, serving more than 1 million people. June 19: An airstrike near a vehicle traveling to Hudaydah city killed four members of the same family and left two children severely injured. June 21: AP released a report on the sexual abuse of detainees, held without charges or trials in UAE-controlled secret detention sites in Yemen. Since releasing its investigative report on human rights violations in such facilities in June last year, AP said it “identified at least five prisons where security forces use sexual torture to brutalize and break inmates.” Four of the five prisons are in Aden, including one at al-Buriqa base, the headquarters of Emirati forces in Yemen, where US personnel have been seen, according to prisoners and security officials. In total, the AP has confirmed the existence of 18 Emirati-controlled secret detention sites in Yemen; the UAE has denied managing or running detention facilities in the country. July 2: Security forces in Aden city detained the chief editor of the local newspaper Aden Tomorrow in the al-Mansoura area. July 3: The Union of Yemeni Journalists announced that Houthi forces had kidnapped the journalist Abdusalam al-Da’is, who was working for the Yemeni News Agency Saba in Sana’a. This report was prepared by Waleed Alhariri, Victoria K. Sauer, Ali Abdullah, Holly Topham, Wadhah Alawlaqi, Spencer Osberg, Osama al-Rawhani, Taima Al-Iriani and Sala al-Sakkaf.